It began more than three decades ago, when Precious Moments creator, Sam Butcher, began drawing the endearing teardrop-eyed children he called "Precious Moments," as gifts for family and friends. Today, his Precious Moments artwork is among the most recognized art in the world, sharing messages of loving, caring and sharing with collectors from around the globe. Precious Moments products are one of the most well known out there. They offer a variety of themes for every occasion. Today, I want you to Take a Ride on the Wild Side with Precious Moments. This "Forever By Your Side" figurine is available on Precious Moments’ website. Today only, they are giving 15% off of love figurines! All you have to do is put in promo code LOVE2016 at check out! I love the detail that went into putting this piece together. It is adorable! Sharing a friendly wave from the side-car of a bright red motorcycle, this free-wheeling joy-rider is happiest when next to the one she loves. The smiles they share together are as bright as the chrome accents on their favorite mode of transportation. This piece is a beautiful tribute to a special love shared by those who crave the wind in their hair. The Bisque porcelain figurine is approx 5 1/4” H.
Forever By Your Side Item #152015 is available on the Precious Moments website for only $99.99. 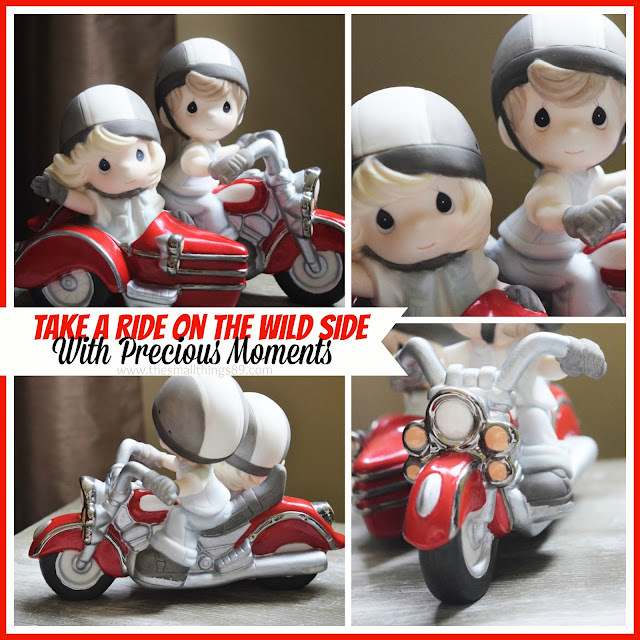 This will make the perfect gift for a motorcycle loving couple, or just a couple in LOVE! Be sure to visit the Precious Moments website to see the other beautiful products that they have to offer. There is something for everybody! You can also visit their social channels below. Have you ever been gifted a Precious Moments item? Do you collect them? I would love to hear!